Karen S. Garvin has been a professional writer since 1988, when "Dragon" magazine published her first article. Her recent work includes encyclopedia entries on historical subjects. She holds a bachelor’s degree in communications and is pursuing a master's degree in European history. Her interests include photography, science, history and Steampunk. Fried rice is a popular entree at Chinese and other Asian restaurants. A typical 1 cup serving of plain fried rice provides about 56 percent of its calories as carbohydrates, 33 percent as fat and 11 percent as protein. Adding meat to the fried rice increases both its protein and fat levels. You can control the amount of fat, calories and sodium in your fried rice by learning to make this simple dish at home. Fried rice contains approximately 228 calories in a 1 cup serving, according to the U.S. Department of Agriculture’s Food Nutrition Information Center. However, other sources list higher calorie counts for the same amount of plain fried rice. For instance, the Healthy Weight Forum’s Chinese food calorie chart shows 363 calories for the same amount serving of plain fried rice. Because fried rice is a type of food and not a single recipe, the calorie count will vary because of the amounts and types of rice and oils used to prepare the dish. If you are counting calories, err on the side of counting too many calories. A 1 cup serving of fried rice contains about 12 to 14 g of total fat, which represents about one-fifth of your daily intake value. The kind of oil that is used to cook the fried rice will determine the specific amounts of saturated, polyunsaturated and monounsaturated fats found in the fried rice. Unless you are making your own fried rice, you may be unable to find out what kind of oil is being used. Fats are necessary for good health and provide you with vitamins A, D, E and K. Try to avoid saturated and trans fats, and consume monounsaturated and polyunsaturated fats in moderation. Just over half of the calories in a single serving of fried rice come from carbohydrates, and it provides about 40 to 50 g of carbs. Carbohydrates are used to make glucose, your body’s main fuel source. Fried rice made with brown rice will include more complex carbohydrates than white rice. Complex carbohydrates take longer for your body to break down than simple carbohydrates and may leave you feeling full longer. 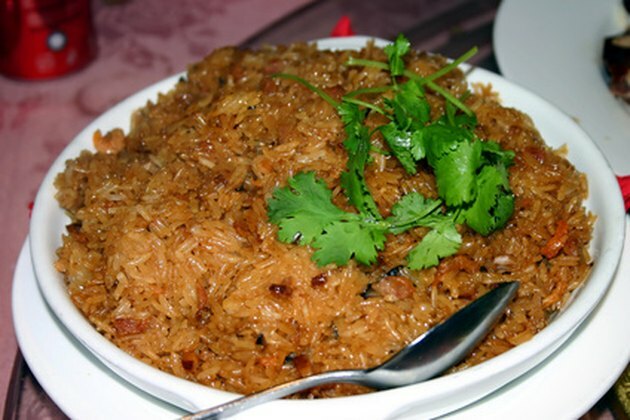 Plain fried rice, made without any kind of meat, provides you with about 7 g of protein per serving. Chicken fried rice, pork fried rice and beef fried rice all provide about 12 g, and shrimp fried rice provides about 11 g of protein. The amount of protein you need in your diet is determined by your age and activity level. The Centers for Disease Control and Prevention recommends approximately 45 to 55 g of protein for adults and teens and less for younger children. Fried rice provides some important vitamins and minerals, but is often high in sodium content. While sodium is necessary nutrient, it is easy to consume too much. Keep the sodium content of fried rice lower by not adding salt or soy sauce to your meal. Fried rice provides the minerals calcium, iron, magnesium, phosphorus, potassium and trace amounts of copper and manganese. Commercial rice is usually fortified with B vitamins. Generally, white rice is used to prepare fried rice meals. White rice contains about 1.5 g of fiber per 1 cup serving, or a little more than 6 percent of your recommended daily intake. Use brown rice to make your own fried rice, and you can increase the fiber to 3.5 g, or 14 percent of your recommended daily intake. Because fiber is filling, you may eat less fried rice in a serving when it is made with brown rice instead of white rice and save yourself some calories.